Jill Thompson is a graduate of the American Academy of Art in Chicago. She has been working professional as a comic book creator since she was a teenager and her work has been published around the world. She is the creator of the Scary Godmother, which has graced comics, stage, and screen, as well as the graphic novel series for younger reader, Magic Trixie. 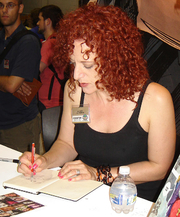 Jill considers herself fortunate to have collaborated on comics such as Wonder Woman, Sandman, The Invisibles, Finals, Beasts of Burden, and many, many more. Jill Thompson is currently considered a "single author." If one or more works are by a distinct, homonymous authors, go ahead and split the author. Jill Thompson is composed of 1 name.